Two of the most important trends in digital marketing — mobile and social — frequently get lumped together, although they are not necessarily parallel channels. After all, your social channel is likely highly mobile, but not all your mobile engagement is going to be social in nature. You could focus on the yellow “Just Starting” bars, but I commend you to the blue “Not on our Radar” segments, which are very short. 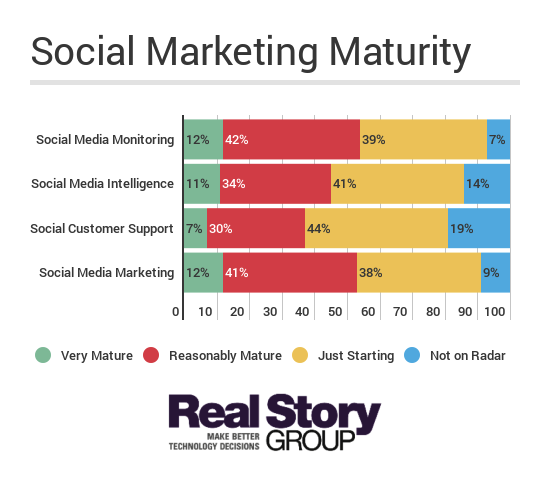 In other words, most enterprises have been working assiduously on social engagement, and in some areas (social media marketing and monitoring) they self-assess as fairly advanced. Of course it’s a separate question whether all this activity has translated into marketing effectiveness. Some recent RSG benchmarking data (sample it here) suggests that enterprises still have some important work to do around process alignment and data analytics. The mobile marketing story is quite different. Enterprise customers self-report much lower levels of maturity for this use case. 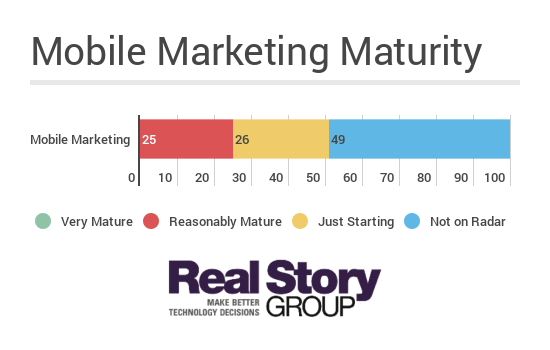 You could lay some of the blame at the feet of vendors; very few of the major MarTech platforms that RSG evaluates pay strong attention to mobile marketing. But I think the major tech providers are just following their customers here, and customers — especially in North America — are not investing heavily, yet. I also think enterprise leaders may be soft-pedalling their answers a bit on mobile, self-reporting low maturity not because they’re paying low attention, but because they remain highly unsure about the effectiveness of their mobile efforts. A savvy digital marketing operation will pay increasingly close attention to mobile. The answer may or may not come in the form of branded native apps and more permission-based push messaging. With respect to mobile web experiences, I believe that that responsive design strategies — while easier for the content marketer — may not suffice for adapting to your increasingly more mobile-centered customer base. In any case, take a lesson from social marketing, and keep experimenting, measuring, and adapting. Founder, Real Story Group: tough-minded analyst firm that evaluates how digital workplace and digital marketing technologies *really* work.